If you look like a zombie, have zombie-like tendencies when you wake up and want to scare the ‘HELL’ out of people, then contact us now. If you like to hear the sound of screamers in the dark, you’ll want this job’ become animated from beyond the dead. 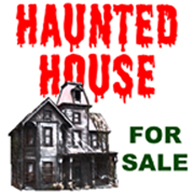 We are looking for volunteer actors/actresses for our Haunted House. Just give us a quick e-mail with your picture, name, age, gender and any other details you believe would make you a good candidate. As a special treat for our volunteer screamers, you will receive the following gift, a free Haunted House pass, an AMC Movie Pass and also a free Scream Works Zombie T-Shirt! (Some restrictions may apply, so contact for details). We are always thrilled to see new faces and also welcome those who have had acting experience. Get a different hands on experience that will make you shine on your resume! OR Are you a unique individual with a special talent or skills? Please note: Must be 16 years of age or older. and the position you are interested in. If you desire an acting position, include your age and gender. We are very open minded to different talents and abilities. Even if you feel it may be abnormal isn’t that what Halloween is about? Please contact us anyway as we are very interested. Thank you for reading our descriptions and like is on Facebook if you would like to see if our attractions match the theme to your talents or just to check us out. Can’t wait to hear from you!